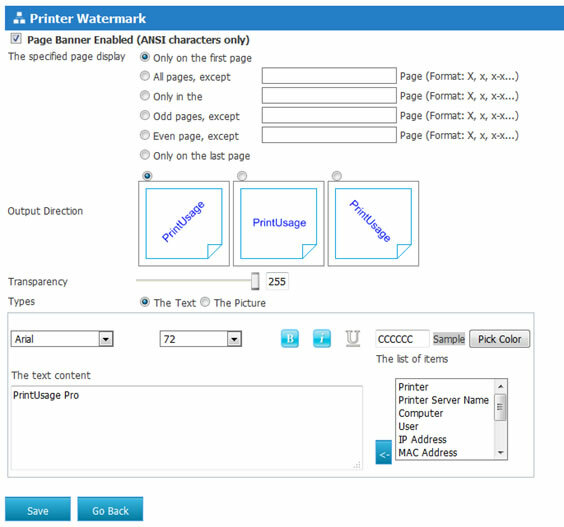 Included with the Enterprise version of PrintUsage Pro is the ability to capture the content of each document that the user prints. To save disk space, this can then be compressed to an image file or stored in the raw format so that it can be re-sent to the printer at the users request. This is especially useful when monitoring speciality printers where it can be very expensive if usage is unrestricted. Documents can be reviewed in a manual audit list before being approved by an administrator. Not all implementations of the PrintUsage Pro system will be in an office environment where each user has their own workstation. In schools and public libraries, shared computers are more common these days. Unfortunately, it being a shared system, there is no way of identifying one user from another, thus making the majority of the extensive monitoring features of PrintUsage Pro redundant. This is where the Authentication Client comes into play. With the client installed on the client workstations, every time a user sends a print job, a user credential window immediately pops up requesting their username and password. The client then passes this information back to PrintUsage Pro who will then determine if they have the necessary usage rights to print that document and then make the appropriate charges. Documents are held in the print queue until the user enters a correct username and password combination. The Authentication Client is a lightweight application that won’t make any complicated changes to the printing procedure for the end user and documents that are not claimed through this client after a administrator defined period of time are automatically deleted from the printing queue to save system resources. With PU UPD, user can add banner (header/footer), watermark, bar code, QR code, and etc. for print jobs. 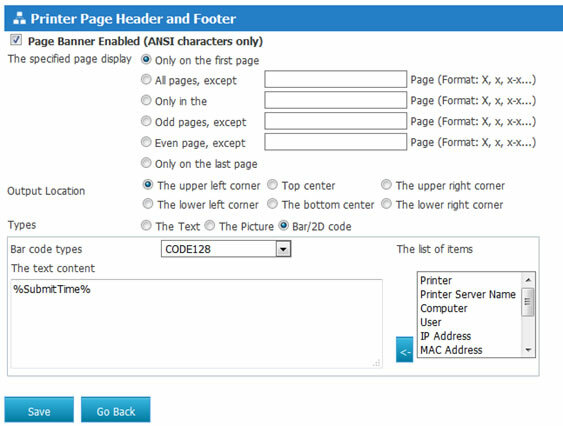 These added items include the printing job properties, such as printer name, print server name, computer, user name, IP address, print time and so on. Bar code support: code39, code93, code128, code 128a, code 128b, code 128c etc. PrintUsage will analyze print job content with PU UPD and save it in database. 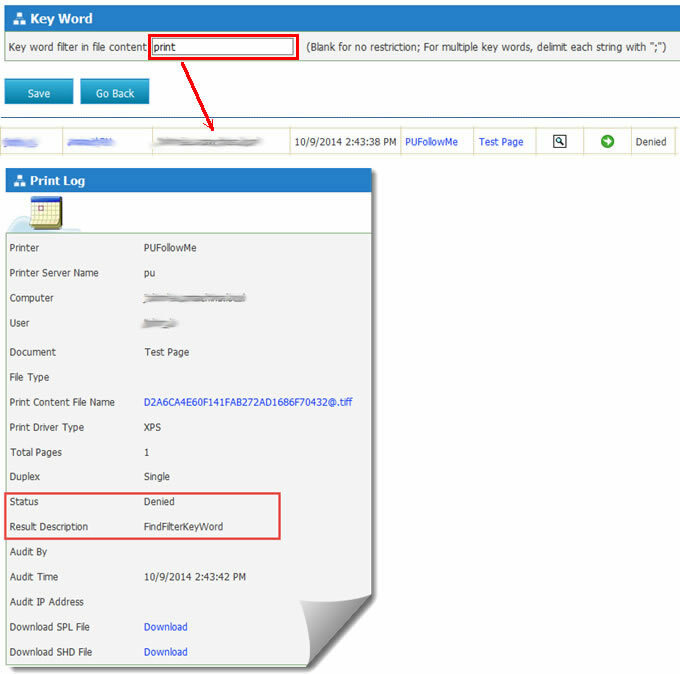 Print job content can be searched through keywords from print logs. Note: not all Print job content can be supported. Content cannot be saved include graphic, pdf file, etc. When searching keywords from print job content words, search “print” for example. 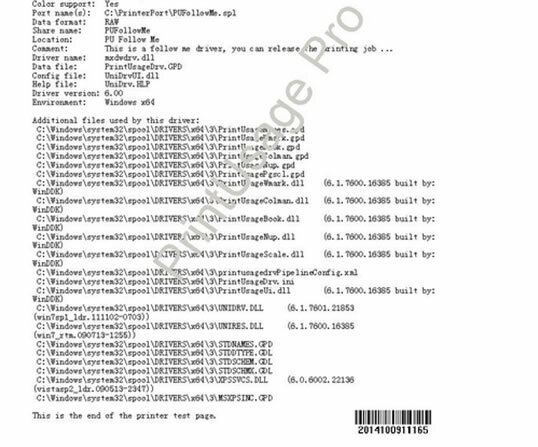 The print logs will list all historical print job including word “print”. The image of content will be displayed with keyword highlighted through clicking the “Content” icon. PU UPD can help user filter print jobs that include specific keywords. For example: system administrator can block all print job include keyword “print”. When user print document that include keyword “print”, the job will be “denied”. For company with multiple branch or office, PrintUsage Pro may be deployed in multiple location while summary report is needed. User can use the report summary function to automatically generate a global report. 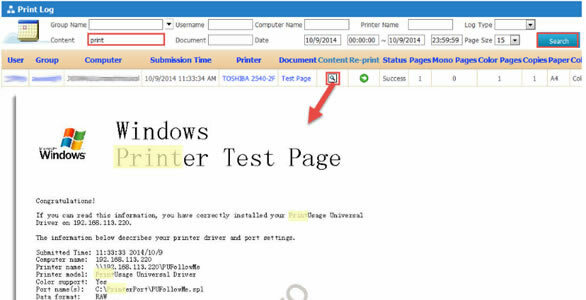 The status of all printers can be monitored on PrintUsage “all printers” page.